Let’s start with the definition of a real projective structure. This is an example of what is called a structure in the sense of Ehresmann; i.e. 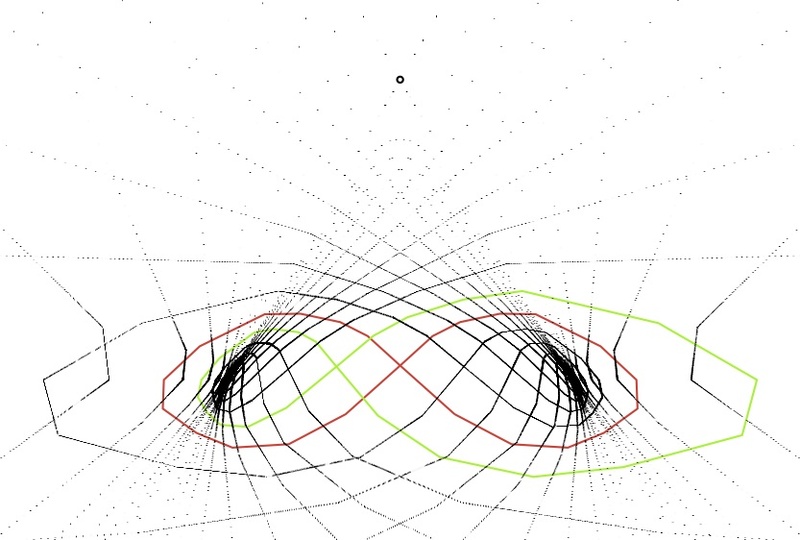 an atlas of charts modeled on some real analytic manifold with transition functions in some (pseudo)group of real analytic transformations . Here is the real projective plane , which can be thought of as the ordinary plane together with a circle at infinity, or as the space of lines through the origin in ordinary 3-space; and is the group , acting linearly on 3-space and thereby projectively on the (projective) plane. Associated to such a structure is a developing map defined as follows. Pick a basepoint and a chart around that point, and use the chart to identify the chart with a subset of the projective plane. Extend the map along each path based at the basepoint by analytic continuation, using the transition functions to move from chart to chart. The result is well-defined on homotopy classes of paths rel. endpoints and determines a map from the universal cover — this is the developing map. It is independent of choices, up to composition with a projective automorphism. In particular, the deck group of the covering acts on the projective plane in a unique manner which makes equivariant. Thus a projective structure determines a holonomy representation . It follows from a general theorem of Ehresmann-Thurston (valid for any structure) that projective structures on near any given structure are parameterized (locally) by the conjugacy class of the representation associated to the developing map; technically, the map from the space of structures to the space of representations up to conjugacy is a local homeomorphism. There are two parts to this claim: first, that any deformation of the representation is associated to a deformation of the structure; and second, that nearby structures with the same holonomy are isomorphic. The first claim can be proved as follows. Think of a representation from as an bundle over with a flat structure giving a foliation transverse to the fibers. In this language a structure is determined by a section of the bundle transverse to ; charts are given locally by the composition of this section with projection along leaves of to a fiber. The key point is that as we deform the flat bundle structure and the foliation by deforming the representation, the section stays transverse so there is an accompanying deformation of the structure. The second claim can be seen by covering by small open charts and choosing subcharts with , and then noting that if are sufficiently close, the image is contained in , and we obtain an isomorphism of structures by patching together local isomorphisms . Note that the point stabilizers of acting on the projective plane are noncompact, and there is therefore no canonical metric on a real projective surface. On the other hand, projective transformations permute the set of straight lines in the plane, so that projective surfaces have canonical families of lines through every point in every tangent direction. 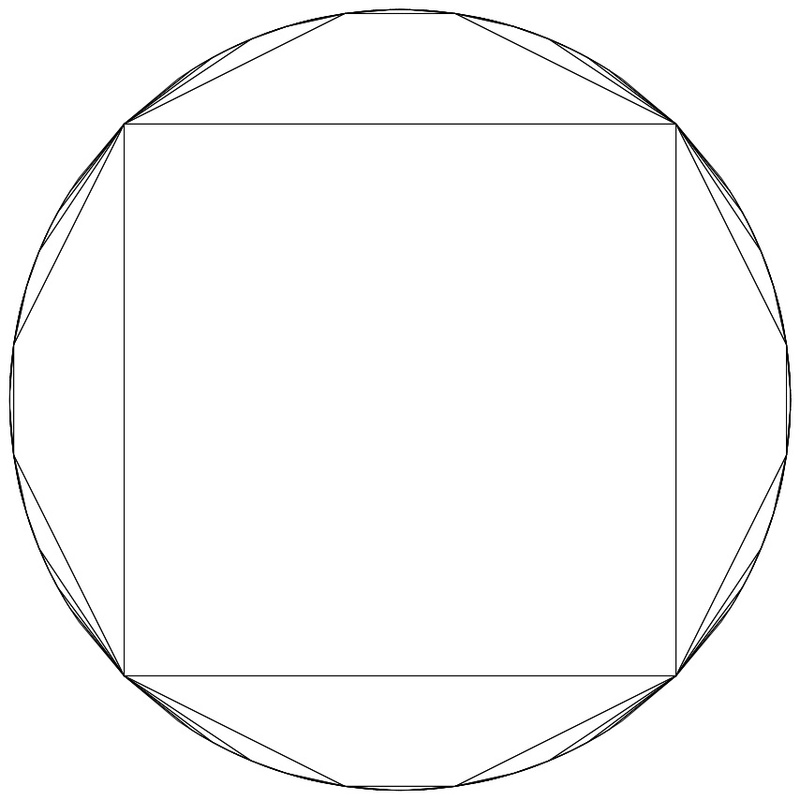 One refers to these lines as geodesics, even in the absence of a natural metric. A real projective structure on a surface is convex if the developing map is a homeomorphism onto a proper convex (open) subset of the projective plane. Thus all such structures arise from a projective action of that stabilizes some and acts freely, properly discontinuously and cocompactly there. Example. 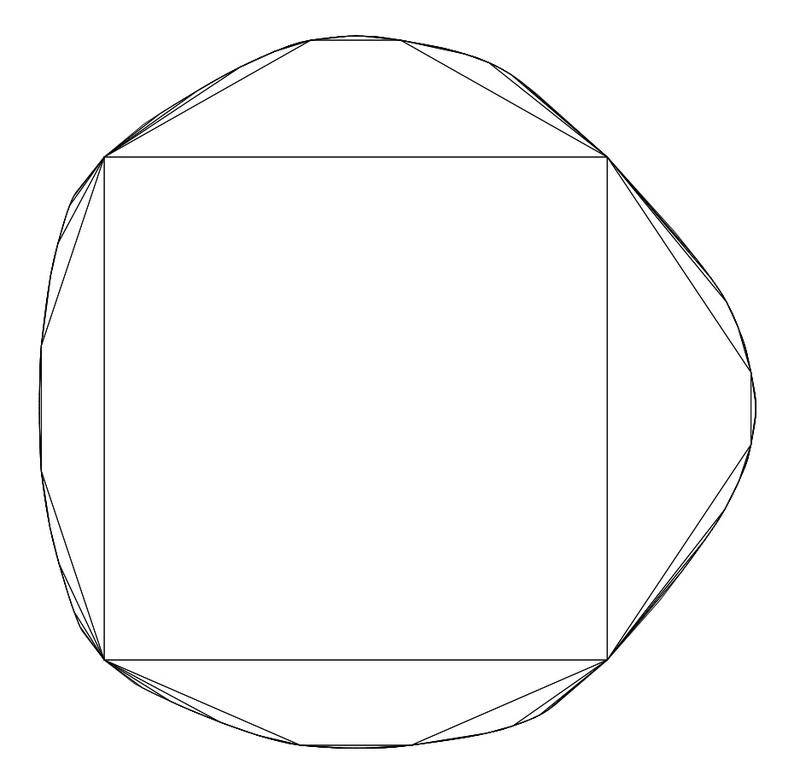 Let be the open triangle in the projective plane with vertices at the (projective) points . Let be the diagonal matrices with entries and for some . Then the projective action of stabilizes with quotient a torus. The figure below shows together with a tiling by fundamental domains. I love how a picture like this lets you “see” a surface immersed in 3-space in terms of the projective impression it leaves on your retina. Theorem (Choi): Every real projective surface with negative Euler characteristic has a unique collection of disjoint simple closed geodesics whose complementary pieces are either annuli covered by an affine half-space, or the interior of a compact convex real projective manifold of negative Euler characteristic. Theorem (Choi-Goldman): The space of real projective structures on a surface of genus is a countable disjoint union of open cells of dimension . The space of convex structures can be identified with a connected component of the moduli space of representations of the fundamental group. Although an arbitrary real projective surface does not carry a canonical metric, the convex ones do. Equivalently, a convex, compact domain carries a canonical metric invariant under projective automorphisms, namely the Hilbert metric. i.e. the logarithm of the cross-ratio of the four points. 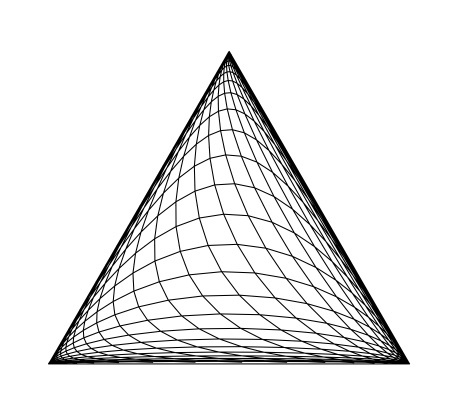 Because of this monotonicity, a (geodesic) triangle in any domain is thinner than the same triangle in any with . By comparison with suitable quadrics, Benoist showed that the Hilbert metric is -hyperbolic if and only if the boundary is “quasisymmetrically convex”; this is a slightly technical condition, which can be expressed prosaically as saying that the limits of projective rescalings near a point on the boundary are strictly convex. It implies, in particular, that the boundary is for some . Note that this part of the story is dimension-independent (and even makes sense in infinite dimensional projective spaces). If is a real projective manifold which is not necessarily convex, it still carries a canonical Hilbert pseudo-metric defined as follows: for any points define to be the infimum of sums over all finite sequences such that each successive pair is contained in a straight segment , and means the distance from to in the Hilbert metric on . This construction is the analog of the construction of the Kobayashi metric on a complex manifold, and the monotonicity of the Hilbert metric plays the role of the Schwarz Lemma. If is convex, this recovers the ordinary Hilbert metric, but otherwise it is necessarily degenerate (the degeneracy, when is compact, is equivalent to the existence of an entire straight line in ; i.e. a real projective immersion of ; this is the analog of Brody’s Lemma in the projective context). I believe that for a surface this metric should be degenerate precisely on the decomposing annuli in Choi’s theorem, but I have not checked this carefully (note: I am not saying this should give a new proof of Choi’s theorem (although maybe it does? ), but that a posteriori one could use the Hilbert pseudo-metric to understand the canonical decomposition). Now let’s explicitly construct some examples of convex projective structures on surfaces of positive genus. The simplest examples are simply the hyperbolic structures: the region enclosed by a quadric is stabilized by a conjugate of in , and can be thought of as the ordinary hyperbolic plane in the Klein model. Such domains are symmetric, since the group of projective symmetries acts transitively on the interior. Some genuinely new examples can be obtained from this one by bending, much as one obtains quasifuchsian deformations of fuchsian groups. Let’s start with a hyperbolic structure on a surface (which is a special case of a real projective structure) and pick an essential closed curve which divides into two subsurfaces . Thus . Choose some which is in the centralizer of in . Then we can deform the representation by conjugating by . Appealing to Ehresmann-Thurston, this deformation of representations is accompanied by a deformation of projective structures. A hyperbolic element of has three real eigenvectors; two correspond to the fixed points on the quadric at infinity, and one corresponding to the point which is the intersection of the tangents to the quadric at and . Thus we may always conjugate to a diagonal matrix with entries . The centralizer of is thus isomorphic to the diagonal matrices; these are spanned by shears (these fix the given quadric, and just deform the hyperbolic structure) and bends . Geometrically, choose coordinates in which the quadric looks like a round circle in the plane, and the fixed points are the top and bottom points (i.e. the intersections with the axis). The centralizer of preserves the eigenvectors, which is to say it preserves the two horizontal tangencies to the circle. Thus the image of the “right hand side” of the circle under conjugation is a new convex curve which fits together with the “left hand side” of the circle to make a convex curve (in general it will no longer be at ). For example, in these specific coordinates, conjugating the right hand side by a “bend” as above turns the half-circle into half an ellipse, sliced along one of its axes. Propagating this bending to the other images of the axis of , we obtain the new limit set as a limit of a sequence of uniformly convex, domains (since the deformations are uniform on all scales, the limit is automatically Hölder, which is to say , as Benoist says it must be). This new domain is (by construction) invariant under a proper cocompact group of projective transformations (namely ) but generically, by no other symmetries; one says the domain is divisible. The figure below shows the “before” and “after” picture for a hyperbolic structure on a once-punctured torus bent along the edges of an ideal square fundamental domain (yes I know a once-punctured torus is not closed, and I am bending along proper geodesics rather than closed ones, but this is easier to draw and gives the essential idea). Although it seems hard to believe, the existence of a divisible but non-symmetric convex bounded projective domain was (apparently) unknown until Kac-Vinberg constructed examples in 1967. Suppose that is a closed surface with a convex projective structure. A maximal collection of essential non-parallel simple closed curves can be realized by a family of disjoint geodesics, which decompose into pairs of pants . Each cuff of a pair of pants has three real eigenvectors, and it is determined up to conjugacy by two numbers: its trace, and the trace of the inverse. The centralizer of a cuff is 2-dimensional (as explained above), so there are an additional two parameters for each geodesic explaining how adjacent pants are glued along each cuff. Finally, Goldman showed that there are two additional real parameters describing the geometry of each pair of pants (once the cuff parameters have been prescribed). Thus, after choosing a pair of pants decomposition, one determines a system of real numbers which describe the structure up to isomorphism. In other words, the space of convex projective structures is homeomorphic to . Notice that the dimension of the space of convex projective structures on a pair of pants is easily seen to be 8, since this is just the dimension of the character variety: a pair of pants has fundamental group which is free on two generators, so the space of representations has twice the dimension of , i.e. 16, while the conjugation action cuts down this dimension by 8. How to describe the parameters for a pair of pants geometrically? Thurston showed how to understand hyperbolic structures on surfaces with geodesic boundary by decomposing them into ideal triangles which can be “spun” around the boundary components (thus finessing the issue of where the ideal vertices should land). A similar construction makes sense for convex projective structures on surfaces with boundary. Goldman obtains his coordinates by understanding the way in which two projective triangles can be glued along their edges in pairs in such a way that the resulting (incomplete) structure on a pair of pants is convex. There does not seem to be a straightforward way to see that these conditions cut out a (topological) cell, fibering naturally over the space of cuff lengths. The existence and uniqueness of a (smooth) solution when is strictly convex was established by Cheng-Yau. Let’s consider the special case where is the unit disk . In this case we expect to be the hyperboloid and the area form on should be the hyperbolic area. In this case we have an explicit formula . Thus and , and we see that solves the Monge-Ampère equation. A similar calculation shows that gives the hyperbolic metric on the unit disk (in the Klein model). The surface with its Riemannian metric is invariant under projective symmetries, and gives rise to a canonical Riemannian metric on associated to the projective structure. The conformal class of this metric thus determines a map from the space of convex projective structures to the Teichmüller space of . and it turns out that this cubic form is symmetric, and holomorphic with respect to the conformal structure associated to the metric on (for a longer discussion of cubic forms see this post). Thus, the space of convex projective structures on is isomorphic to the total space of the bundle of holomorphic cubic differentials over Teichmuller space! where is the bundle of holomorphic 1-forms (which is the cotangent bundle on a Riemann surface). Now, so taking we get . Thus the space of convex projective structures has complex dimension , and real dimension . Monge-Ampère equations arise in minimal surface theory, and one may think of this instance in a similar way. A convex real projective structure determines a holonomy representation of the fundamental group into , and one may look for a harmonic equivariant map from the universal cover to the symmetric space. A harmonic map is a minimal surface if it is conformal; thus an equivariant minimal surface in the symmetric space picks out a conformal class. Associated to such a minimal surface one obtains a holomorphic cubic differential, much as a suitable triple of holomorphic 1-forms determine a minimal surface in Euclidean 3-space by the Weierstrass parameterization. This construction is due (independently) to Loftin and Labourie. This entry was posted in Complex analysis, Geometric structures, Projective geometry, Surfaces and tagged Bill Goldman, convex real projective structures, cubic differential, David Dumas, higher Teichmuller theory, SL_3(R). Bookmark the permalink.